By Keith Cowing on April 5, 2018 1:12 PM. "With such a flurry of activity--from Elon Musk and Space X to the Administration's vow to send Americans to the moon and Mars--we see an opportunity to take advantage of a gap and make POLITICO the foremost leader in covering the 21st Century space race." The new POLITICO Space newsletter is launching in partnership with Boeing and will be released each Friday beginning April 6. It will be accompanied by an official launch event on April 12, featuring Scott Pace, Executive Secretary of the National Space Council and Mary Lynne Dittmar, President and CEO of the Coalition for Deep Space Exploration. The event will also feature a conversation between Dennis Muilenburg, Chairman, President and Chief Executive Officer of The Boeing Company and Patrick Steel, Chief Executive Officer of POLITICO to discuss strategic priorities of the aerospace industry. More information about the event can be found here. Sign up for POLITICO Space here"
Keith's note: So, a newsletter aiming to be the "foremost leader" in space news overtly sponsored by a "partnership" with a big aerospace company. How much more fair and balanced can you get? LockheedMartin has that Lexington Institute thing to carry its water and bash its competitors so its only fair that Boeing try something too. Not sure what the "gap" the Politico folks are talking about is since Aviation Week and Space News (and us space website guys) have been covering the beat for decades. All of the speakers at the launch event are status quo or big aerospace types. Lets see if they actually cover the other companies who are not footing the bills - and what happens outside the Beltway ... that said, welcome to the space party Politico! \"With such a flurry of activity--from Elon Musk and Space X to the Administration's vow to send Americans to the moon and Mars--we see an opportunity to take advantage of a gap and make POLITICO the foremost leader in covering the 21st Century space race.\" The new POLITICO Space newsletter is launching in partnership with Boeing and will be released each Friday beginning April 6. It will be accompanied by an official launch event on April 12, featuring Scott Pace, Executive Secretary of the National Space Council and Mary Lynne Dittmar, President and CEO of the Coalition for Deep Space Exploration. The event will also feature a conversation between Dennis Muilenburg, Chairman, President and Chief Executive Officer of The Boeing Company and Patrick Steel, Chief Executive Officer of POLITICO to discuss strategic priorities of the aerospace industry. More information about the event can be found here. 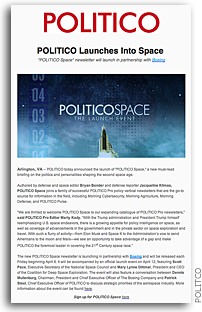 Sign up for POLITICO Space here\"\n\n Keith's note: So, a newsletter aiming to be the \"foremost leader\" in space news overtly sponsored by a \"partnership\" with a big aerospace company. How much more fair and balanced can you get? LockheedMartin has that Lexington Institute thing to carry its water and bash its competitors so its only fair that Boeing try something too. Not sure what the \"gap\" the Politico folks are talking about is since Aviation Week and Space News (and us space website guys) have been covering the beat for decades. All of the speakers at the launch event are status quo or big aerospace types. Lets see if they actually cover the other companies who are not footing the bills - and what happens outside the Beltway ... that said, welcome to the space party Politico! This page contains a single entry by Keith Cowing published on April 5, 2018 1:12 PM. NASA OIG Finds Problems at Goddard Institute for Space Studies was the previous entry in this blog. Virgin Galactic Lit The Candle is the next entry in this blog.